Aston Villa boss Christian Benteke has finally found his shooting boots recently, and rescued a point for the club against fellow strugglers QPR on Tuesday night, and manager Tim Sherwood has backed the Belgian international to fire the club to safety, the Daily Mirror reports. The big striker has struggled for form since returning from an achilles injury back in November, but is now firmly back amongst the goals with seven in his past five games. He produced a dramatic late free kick against QPR to keep the Villans out of the relegation zone and give them a three point cushion. This came after he had originally brought the club level after going behind early on, and then giving them the lead with a composed finish just before the halftime break. And now Sherwood is looking to Benteke for inspiration in keeping the side out of danger and in the Premier League. 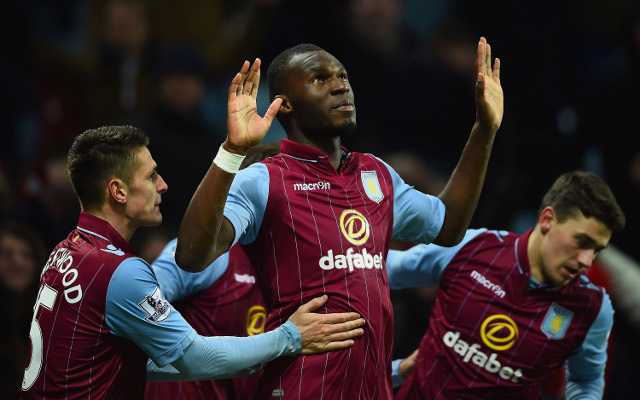 “It doesn’t come much better than that does it,” said Sherwood reflecting on Benteke’s heroics,” Sherwood said. “He is a good player, I have always said it. “He is in a rich vein of form at the moment and I am pleased for him. “It is fantastic for him to score the the goals, it is just a shame we didn’t get the three points.